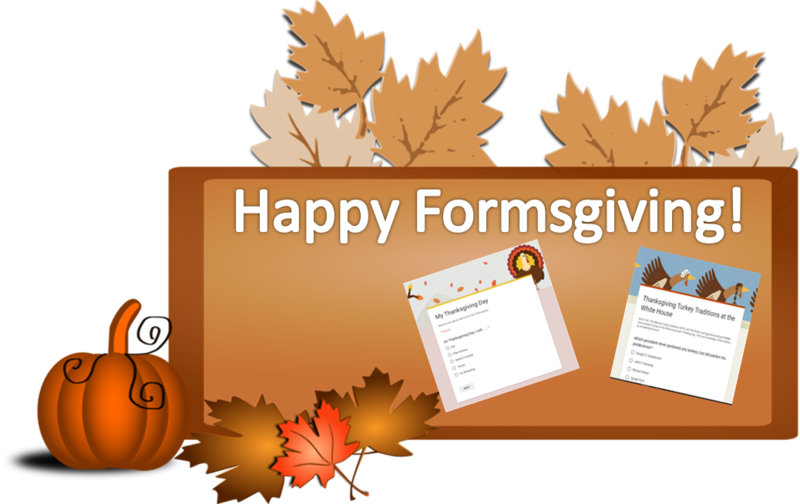 This Thanksgiving, why not give thanks by utilizing Google Forms in the classroom? I have been thankful ever since I began using Google Forms; it makes real-time work and collaboration a creative joy. Here are some classroom applications of Google Forms this Thanksgiving. Have students complete a Today I’m Thankful Because Google Form with things they are thankful for. Students complete a form, then the teacher can generate a list of their responses and display some of the commonalities. Another idea is to generate a word cloud from the list. The word cloud below was created using Wordclouds.com. It allowed me to paste the list from my Google Sheet and then upload an image of a turkey to use as an outline. Write descriptive paragraphs in Google Docs about the things they are thankful for. Create posters in Google Drawings of their thankful lists. Draft letters to people they are thankful for using a Google Doc template. Rely on Google Forms to quiz your students on the history of Thanksgiving. This quiz focuses on the turkey traditions at the White House. 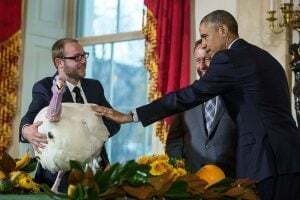 The President of the United States pardons a turkey on the eve of Thanksgiving at a White House ceremony. This tradition of compassion dates back fifty years to Harry Truman. Test your knowledge. Learn how Thanksgiving became a national holiday. Embed a video about the history of Thanksgiving on your Google Form. Then quiz your students. Compare the first Thanksgiving dinner in colonial times to the one we celebrate with today. Students delight in the differences. You can also have them share what unique foods they will see on their Thanksgiving table. Quiz students about fun facts about turkeys. 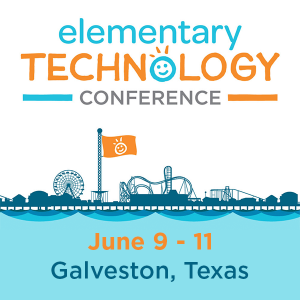 Enable them to use multimedia to share what they learn about these fascinating birds. Students love to read “Choose Your Own Adventure” stories. Therefore, why not let them create their own story using Google Forms? These stories can be created by taking advantage of section breaks in Google Forms. When an option is selected on the form, it will go to a unique page about that particular answer. Before getting started, it will be very helpful to have students brainstorm their ideas by creating an outline first. If you could have any guest at Thanksgiving, who would it be? What would happen if a scarecrow joined you for dinner? You have magically become a pilgrim. Describe your day. 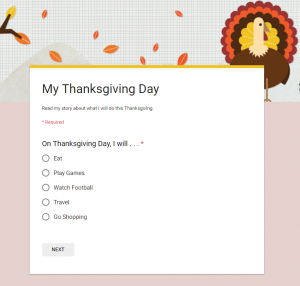 These are just a few ways to use Google Forms this Thanksgiving. I can’t think of a better time of the year to engage the imagination of your students and encourage them to be creative. Let us know in the comments below how you are using Google Forms in the classroom.